One of the most important product for beautiful, smooth glowing skin is a good moisturiser. One moisturiser is too oily and other is too dry for skin. Finally found a perfect moisturiser for oily and acne prone skin, Hedonista Glycerin & Lavender-Vanilla Clear Moisturiser. All the nail paint lovers would agree, its pretty irritating to remove nailpaints. Hate it when I have to spend hours rubbing it off and hate it even more when nail are keft dry, dead and dull by the nailpaint remover. I have used a lot of them in all these years, here is my favourite, a cheap and best nail paint remover. SO Today we will be trying out this interesting nail polish pen. I got it in my January Fab Bag , it was the product that I choose for myself. The idea of having a nail polish in pen form is interesting and I though lets see if this really makes life easy !! We all want smooth and clear skin, right ! But do you know a easy home remedy for smooth skin ! Yes, body scrubbing has so many skin and beauty benefits. Undoubtedly when we speak of style and womanhood in Bollywood, we generally think of Kareena Kapoor Khan as the role model. And it isn’t shocking when the model & actress has never let our eye balls down while stepping on the ramp. This would be Mom will definitely hit the list of sexiest mom in the world. Once famed as zero-figure and now gloriously flaunting her baby bump, Kareena knows very well how to show the beauty of different stages of life. Today is Tuesday, and here I am with another episode of #tryittuesaday . So today I will be trying out DIY Black Head strip. This is a charcoal black and white head peel of strip and I am super excited and hopeful that I will work amazingly. No matter how much we want yo stay in bed all day, we just have to get up and get going. But before you start your day in full force, you need to prepare your body and get it going. Here are 5 Best ways to Start Your Morning. 1. Don't Cut Cuticles- Never cut all the way around the cuticle because that will cause the skin to become ragged and tear, opening the body to bacteria. 2. Don't File Nails Back and Forth- Never saw back and forth on the tip of the nail, as this will weaken nails. 3. Give gap between nail paint application- Always keep nails bare for a few days between nailpaint applications. 4. Don't peel off old nail paint- Picking away at old or chipped nail polish will aggravate the nail bed and lead to damage. 5. Don't use nails as Tools- Take a conscious effort to pay close attention to how you use nails. Don't use them to open boxes and stuff like that. 6. Apply Hand and Nail Cream- Moisturize your hands with hand cream or cuticle oil every time you wash your hands. 7. Eat a well balanced Diet- Nails are made out of protein, so add more to your diet. 8. Get Regular Manicures- Regular manicures help keep nails healthy and push cuticles down. 9. Try to use chemical free products- Now you can find vegan and chemical free nail products, try to get your hands in them. 10. Don't go overboard with hand sanitizer- Using too much hand sanitizer can dry out not only hands but nails too. By following these easy nail care tips, one can easy have shiny and strong nails. These simple tip will make a huge difference in you nails, there will be no more chipping or breaking. Also check out my Home Remedies for Nails. If you guys have been following me for long, then you know I have super oily, acne prone and sensitive skin. When it comes to finding the best products for acne prone sensitive skin, it's always a battle. Finally I found the best face wash for oily skin. It literally vanishes acne and pimples. Magic product that I am talking about is, Vichy Purete Thermale. A very happy Monday. This time My Envy Box came in super early so On thought why not share my views with you guys. Do here is unboxing and review of September My Envy Box. The world is going fitness crazy. We all are about yoga and healthy eating. Green tea plays a very important role in this fitness journey. 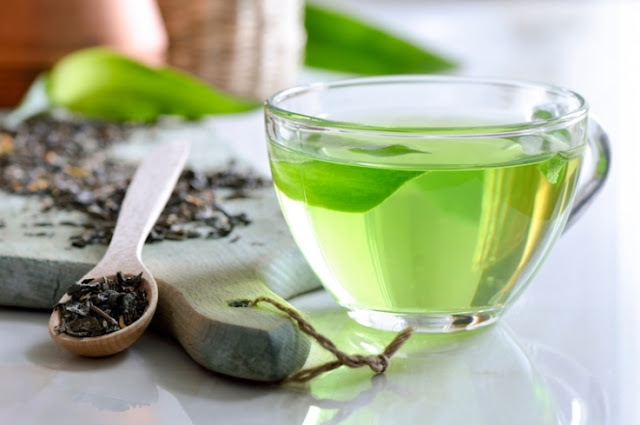 Here are 10 benefits of green tea. I love me a good highlight. Don't you think a highlight and a blush is something that adds the life back to the blank canvas that we create. Recently I go this Geri G Blending Cheek and Eye Duo in my August Fab Bag , its a powder highlight and blush that can be used as loose eye shadow as too. With our kind if life, we are always on the go. Either we are out in sun or stressing out on the work desk, our skin is under makeup and gets super tiered. Here are 5 beauty tips you must follow before bed time. I am a sucker for bathing products, just love the body washes and bath salts but not a soap kind of a person. But recently I came across a soap that really pushed me to give it a go and Dang! It totally is the best smelling soap ever. The soap I am talking about is Forest Essentials Luxury Sugar Soap. A lot of us struggle from acne. Try anything and everything to get clear skin. But we don't understand that something in our diet might be triggering it. Here are foods that cause acne. I am loving how the fun fashion, beauty and hair trends are becoming more and more popular lately. Saw these twin buns going around for long and finally gave in. Here are my easy messy twin buns, perfect for all hair lengths and textures. So, I am a big fan if Maybelline for their mascaras, the brand has it down when it comes to mascaras. Maybelline Falsies is my holy grail, but before it was launched, Maybelline Colossal Volum Express Mascara was what all I used. Its time for August My Envy Box which us monsoon themed. We all know how difficult it is to take care of skin and have the perfect makeup ! The weather is way too moist, the humidity makes skin super oily and makeup does not stay.